Swainson, Donald. "Edward Blake". The Canadian Encyclopedia, 01 December 2016, Historica Canada. https://www.thecanadianencyclopedia.ca/en/article/edward-blake. Accessed 26 April 2019. Edward Blake, second premier of Ontario and leader of the federal Liberals, served in politics for nearly a quarter-century from Confederation onward. Honorable Edward Blake as president of the Privy Council, April 1878 (courtesy Library and Archives Canada/PA-27030). Edward Blake, lawyer, politician, premier of Ontario (born 13 October 1833 in Adelaide Township, Upper Canada; died 1 March 1912 in Toronto, ON). Blake served in politics for nearly a quarter-century from Confederation onward. As federal Liberal leader, he never became prime minister, but he recruited into Parliament a protégé who would become one of the country's greatest leaders – Wilfrid Laurier. The son of colonial-era lawyer and politician William Blake, Edward was an unhealthy child and received, according to his mother, "a desultory sort of education for some years — and in the morning while dressing [his father] gave him his Latin lesson." A tutor and his mother taught him other subjects. Blake then attended Upper Canada College and the University of Toronto, where he received a Bachelor of Arts in 1854 and a Master of Arts in 1858. He studied law simultaneously and was admitted to the bar in 1856, becoming a successful and wealthy equity lawyer in Toronto. In 1858, he married Margaret Cronyn, daughter of the first Anglican bishop of Huron. Blake, a Liberal, was recruited into active politics in 1867 by George Brown, proprietor of the Toronto Globe newspaper, who commented that, "Edward Blake is ready and will be a boost. As a lawyer he is admirable — excellent common sense, immense industry and great pluck. Not much of a politician, but anxious to learn and as sharp as a needle." Blake held the constituency of South Bruce provincially from 1867 to 1872, and sat in the federal House of Commons from 1867 to 1891. In 1868, he became leader of the Ontario Liberal Party, and in 1871 ousted Premier John Sandfield Macdonald to become the second premier of Ontario. He left provincial politics in 1872, but during his brief tenure as premier he established the Liberal dynasty that ruled Ontario from 1871 to 1905. In 1873 Blake refused the leadership of the federal Liberal Party, but agreed to join Canada's first Liberal government under Alexander Mackenzie. 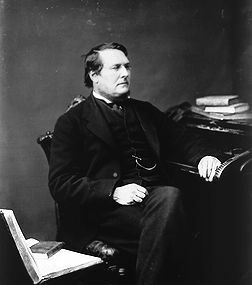 Blake served in Ottawa as minister without portfolio (1873–74), minister of Justice (1875–77) and as president of the Privy Council (1877–78). He succeeded Mackenzie as party leader in 1880, but lost the subsequent elections of 1882 and 1887. He then resigned the Liberal leadership in 1887 and left Canadian politics in 1891. In 1892, Blake entered the British House of Commons as an Irish Nationalist member of Parliament. He retired to Canada in 1906, and for many years served the University of Toronto as senator and chancellor. The only Liberal leader (until the 21st century) who never became prime minister, Blake never attained the prominence his abilities warranted. Part of his lack of success was poor luck: as Liberal leader in the federal elections of 1882 and 1887, he was required to face John A. Macdonald, then at the height of his popularity. At the same time, Blake authored some of his own problems. As party leader, he was excessively dominant in party matters and parliamentary activity. He often gave long speeches — up to six hours in length — that left little for his colleagues to say, and consequently left them minimal opportunity to display leadership, gain experience or please the electorate. The result was a somewhat alienated Liberal high command, a problem illustrated by the eminent Liberal front-bencher, Sir Richard Cartwright, who noted in his memoirs that in the House of Commons Blake routinely left "nothing for his supporters to say." Cartwright described this syndrome as a problem which "became almost a positive disease," and further described Blake as a man of great "general ability," but "intensely ambitious," "exceedingly sarcastic," and "absurdly sensitive to criticism," who "often behaved like a spoilt child." John Charles Dent, perhaps Canada's best 19th-century historian, suggested that Blake possessed "a manner as devoid of warmth as is a flake of December snow, and as devoid of magnetism as is a loaf of unleavened bread." However, Edward Blake did leave his mark. He encouraged the Canada First movement and English Canadian nationalism, and he recruited Oliver Mowat (his successor as premier of Ontario) and Wilfrid Laurier (his successor as federal leader) — two of Canada's most effective and electorally successful politicians. M.A. Banks, Edward Blake (1957); F.H. Underhill, "Edward Blake," in C.T. Bissell, ed, Our Living Tradition (1957); Joseph Schull, Edward Blake (2 vols, 1975-76).